Invest in yourself and Achieve more. 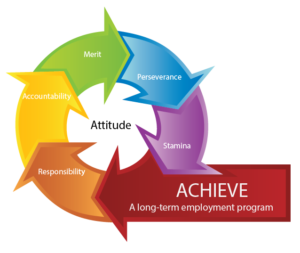 For over 7 years, the Achieve Program has helped transform lives by preparing individuals for securing and maintaining future employment. This no-cost program is open to the public. Ideal candidates need to be interested in obtaining employment lasting longer than a year. One-on-one meetings with a career coach to discuss individual situations and address barriers. Small group workshops to discuss and develop resumes and job search tools, as well as interview techniques. Large group workshops focused on team building, communication skills, and goal setting, raising self-confidence, handling stress, and more. One-on-one meetings with a business engagement representative who has employer connections and can assist with interviews. Achieve is skilled in serving people from a wide variety of backgrounds, skills, education levels, and experiences. Some of our participants have found long-term success in the following positions: manufacturing, customer service, management, information technology, healthcare, construction, office administration, retail, janitorial, skilled labor, food service, and welding and fabrication. Come to an Information Session any Friday at 10am at the Goodwill Employment Center, 3777 Sparks Dr SE, Grand Rapids, MI 49546 (Bus route #5, #24 or #28) or call the Achieve Program Coordinator at 616-588-2213.